A hangar at Felts Field holds many movable hospitals. One helicopter sits fueled up, the pilot and medical crew just a few steps away. Another has its casing removed and a mechanic fiddles with its innards. On the other side of the building, an ambulance just pulled in after transferring a patient from one hospital to another; its driver heads to the break room with a Subway sandwich in his hand. A fixed-wing takes up the most space in the hangar, ready to fly someone in need as far as Seattle. The communications center sits in the middle of all this, the staff set to scramble at a moment’s notice if a far-flung emergency arises. This is the home of MedStar, the Inland Northwest’s only ambulance service that flies. MedStar is just one of the organizations ready to help when someone in the region calls 911. Beside the dispatchers, there are first responders, police officers, firefighters, EMTs, paramedics and volunteers. There are the folks at American Medical Response, the ambulance provider for both the city and county. There is MedStar. Washington State Patrol automatically gets notified if there’s an accident on the highway. It begins, of course, when you dial 911. The first person to answer works for the police department. “If it’s medical, they’ll ask if it was violent,” says Kim Blashill, supervisor for Spokane police dispatch. “If it’s not, we’ll send you over to fire dispatch,” which is a separate entity located in the same building. One of up to five fire dispatchers on duty is the first to enter information into the region’s computer-aided dispatch system, in which all the necessary agencies are connected. Without saying a word, fire dispatch will have at hand info straight from the caller’s phone. This will include the phone number and the address if it’s a landline. If it’s a cell phone, it might provide the cell tower the call last bounced off of, and a GPS location if the connection is good. It’s at this point that dispatchers and emergency personnel must determine which mode of transportation is faster if a patient needs to get to a hospital. Generally, and regardless of the extent of injuries, if the emergency is within city limits, AMR is the best choice to respond and sends one of its 20 ambulances. Each ambulance has a paramedic and an EMT on board. If you’re transported by AMR within city limits with basic life support, the rate begins at $382 plus $17.57 per mile you’re moved. For advanced life support, the initial charge is $527 plus the same mileage rate. Receiving oxygen adds another $44. Beyond city limits, the base rate jumps to $900, plus a per-mile fee. These rates can be shocking, but Jernstrom likes to remind people that it’s a service to save lives, not mass transit. “If we don’t transport you, we don’t charge you,” she says. If someone else calls 911 and the first responder determines that you have the capacity to make decisions, you can turn the ambulance away. MedStar’s rates are a whole different thing. Base rate for emergency transport in a helicopter is $13,830, plus $121 per mile flown with the patient on board. “A lot of that is the cost of readiness,” says Bisson. Helicopters are worth $4 million. Insurance is $12,000 a month, not to mention fuel costs and personnel, who are all double certified as either nurse and paramedic, or EMT and respiratory therapist. Some folks know their odds of needing MedStar’s attention are better than most, since they live in the middle of nowhere or are on ski hills all winter long. For these people, MedStar offers an annual $59 membership, which offsets the cost of a ride. About 27,000 people have signed up for this service. Most of MedStar’s work entails moving patients from hospital to hospital. 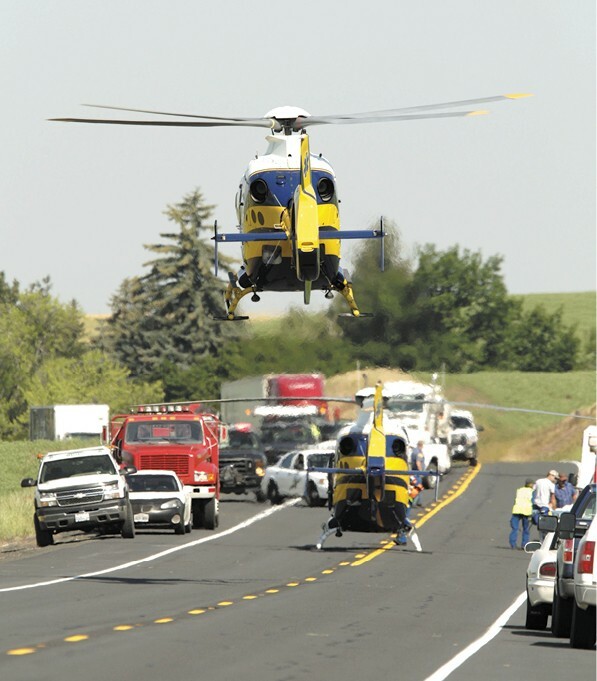 Just 17 percent of the work its helicopters do is “scene work,” or 911 calls. Of these calls, MedStar’s goal is to be on the ground for 10 minutes. The important thing is getting someone who’s hurt to a hospital. Peggy Hensley works two days a week as a transport triage nurse for MedStar and a medical liaison in its communications center. She estimates that most calls last 30 to 40 minutes, from hangar to hospital. Sometimes the ride is bumpy. Other times it’s frightening. Once the crew gets to the closest appropriate hospital, the patient is out of their hands. For them, the emergency’s over and the waiting, and paperwork, begin anew.